Seiler has partnered with the top manufacturers for Indoor Mobile Mapping Technology. For a demo on any of our emerging tech products or further inquiry please contact us here. GeoSLAM are the experts in 3D mobile mapping. GeoSLAM is a global market leader in “go-anywhere” 3D mobile mapping technology. The GeoSLAM unique technology is highly versatile and adaptable to all environments especially spaces that are indoor, underground or difficult to access, providing accurate 3D mobile mapping without the need for GPS. View here the ZEB-REVO Solution datasheet. Lightweight, revolving laser-scanner. Handheld, pole-mounted, or attached onto your chosen mobile platform such as a vehicle or UAV and pass through your target survey environment to record more than 40,000 measurement points per second. 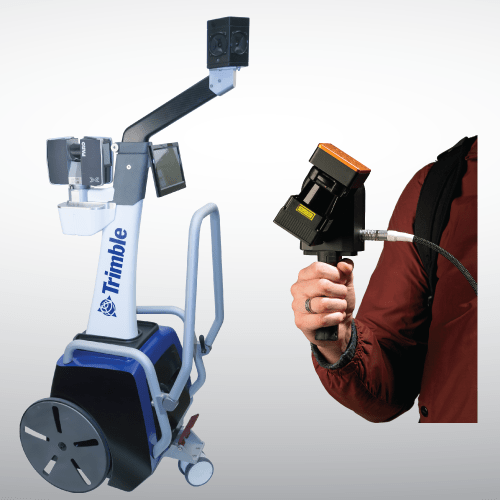 TIMMS (Trimble Indoor Mobile Mapping System) provides both LiDAR and spherical video, enabling the creation of accurate, real-life representations (maps, models) of interior spaces and all of its contents; every object in the interior space – including desks, chairs, stairs, and doors – appear in the plan. The maps are geo-located, meaning that the real world positions of each area of the building and its contents are known. View full brochure. View one page flyer here.